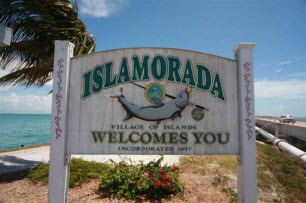 In 2008, National Geographic placed Islamorada on their list of top 12 cities in which to live and play. That’s quite an accolade, and especially when not one other city in Florida got into the top 50! 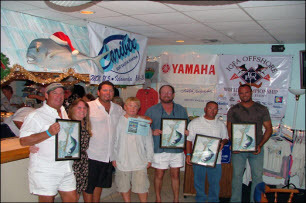 So what is it about this area of the Florida Keys that makes it so sought after and prize winning? Well I could say that if I have to tell you the answer to that question, then what have you been doing with your life? So I will begin with some facts about where it is, and then we will tell you what occurs there, what interests people living in the area have, and then finish with tourist information, such as hotels, restaurants and things to do. So if you are sitting comfortably let's begin. It is about a third of the way down the string of islands known as the Florida Keys. If you consider that down is towards Key West, and up is towards the mainland of America, you will get an idea of where it is. If you are planning on travelling to the place then just to give you an idea of how long it is going to take you, Islamorada is 1 1/2 hours from Miami international airport and 2 hours from Ft Lauderdale airport. So lets try to give you a few of the major destinations around the Florida area, so you can get a greater understanding of your journey time. One warning if you are planning on driving to Islamorada, then you will often be caught up in slow moving traffic on US1 aka the Overseas Highway. When you are surrounded by water on both sides then there isn't much that you can do about it I'm afraid. How Big Is Islamorada Actually? It totals a land area of about 7.1 miles and is presently sitting 5 feet above sea level. 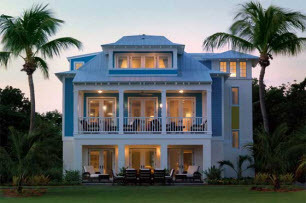 For more detailed facts ranging from what percentage of the population are white, how much the average person earns, and how much an average house goes for then click here, and all your Islamorada facts and figures will be answered. If you want however to get a good understanding of the history of the area you cant do any better than spending sometime looking at the following pages that all review the founders, the creators, the tragedies and the visionaries that made it what it is today. What Does Islamorada Have Going For It Then? Well for a start this is known as the "Sportfishing Capital of the World" so if you are looking for the most excitement you can have with a fishing rod, then you are in for the treat of a lifetime. Bud N Mary's Marina on Oceanside has over 40 experienced charters and guides, who can make your fishy dreams come too and will be more than happy to take you out onto the waters. Which actually leads me onto an interesting "Watery fact"
Well, I think we should name it as it really is, because this is THE place for water fun. Whether you are a diver, a fisherman or just fancy dipping your toes into the water then there can be no better place for you to visit and experience just what the great outdoors has to offer. 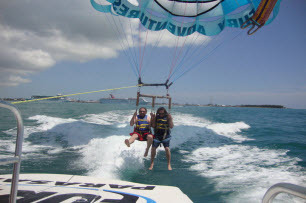 In addition to fishing, the Atlantic Ocean and Florida Bay provide adventure such as parasailing, wind-surfing and kayaking too. Which was what the famous sportsmen and authors like Ernest Hemmingway and Zane Grey, were attracted to. And who could blame them, as when you walk happily around the area, you will see exactly the attraction for outdoor competition, and this is why every month the keys offer a huge selection of Fishing Tournaments races and other sporting challenges. The four islands that form Islamorada, give you every opportunity to find your own secluded spot to grab as much of the Florida Keys sunshine as you can........without anyone else interrupting the peace and tranquility. So whether its enjoying what is going on under the water, on the water, or above the water, you certainly will find enough to entertain you whilst you vacation your stresses away. Where Can We Find The Best Hotels, Motels And Resorts To Stay In? Dont worry about finding a great place to stay as a wide range of Accomodation and hotels are just a click away. You can choose from romantic, to dramatic. They really cater for every requirement and taste. But maybe you love the area so much you fancy buying a place and moving in? However, to live here does not come cheap. In fact the cost of living is high. To buy a property here, will cost you somewhere in the region of $1,000,000 and of course as most people love the water in Islamorada properties near the waterfront can be much higher still. Upper Matecumbe Key is the heart of Islamorada, commercially developed but with many quiet residential areas tucked along the waterfront. Lower Matecumbe is the areas residential island, with a bike path, tennis club, and private beach. All in all it’s certainly worth a visit. One thing you can be sure of when visiting Islamorada is due to the focus on fishing and everything sea based, the restaurants are top notch. Well that is if you love a bit of seafood, as the fish is literally still swimming when its prepared for the dish. You will not taste fresher anywhere I can sure you. But perhaps you don't like fish, and the thought of nice piece of snapper leaves you cold, well don't worry, all the restaurants cater for steak lovers, salad munchers, vegan, kids, the list goes on and on. So take a look at our guide to the best restaurants in Islamorada, and then as you continue down the US1 or Overseas Highway as its also known, you will have all the information to turn off and have the greatest meal of you life. The Florida Keys History of Diving Museum in Islamorada was not a place that I though "Yeah, before I do anything I want to go to this place." But I was surprised, after visiting, just what lies the other side of its doors. This attraction is not just famous on Islamorada, but is one of the premier Dolphin swimming days in the world. As with most of the beaches in the Florida Keys the ones found here aren't always what you would look at and go "Yeah...that's what I call a beach!" Most of the time they are small bits of sand surrounded by either Sea Oats or mangrove, but in their own way this unpretentiousness just adds to their charm. Check out our page on the best that Islamorada has to offer in beaches, however if you want the huge expanse of sand type of beaching experience you might want to drive back to the mainland of Florida and spend a day in Miami for example.